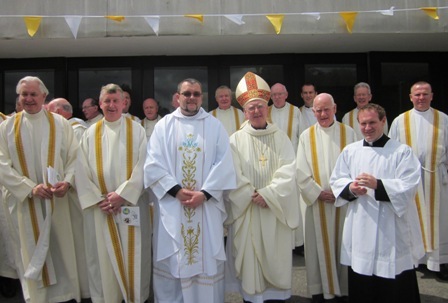 After his Ordination by the Bishop-emeritus of Lodwar, Kenya, Rt Rev Patrick J Harrington SMA, Fr Kevin and the bishop posed for some photos with the concelebrating priests. 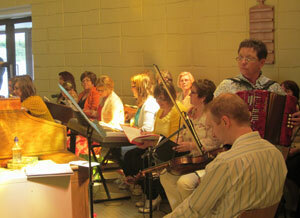 Musicians and singers from the two choirs in the parish came together to sing for the Ordination Mass. Many remarked on the beautiful Hymn to St Anne sung after the Communion of the Mass. Before the Closing Prayer of the Mass, the former Parish Priest of Donagheady, V Rev Fr George Doherty, presented Fr Kevin with a Chalice which he, in turn, had received from the late Fr Conway, a native of the parish. In a wonderful address Fr Doherty explained the reason for this wonderful gesture, appreciated by all but most especially by Fr Kevin. 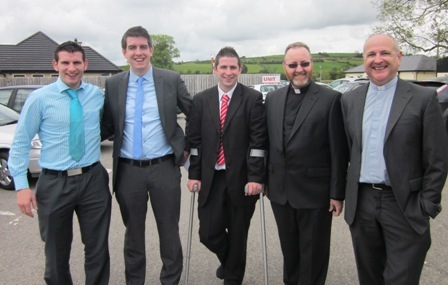 Read Fr Doherty’s remarks and view photos here. 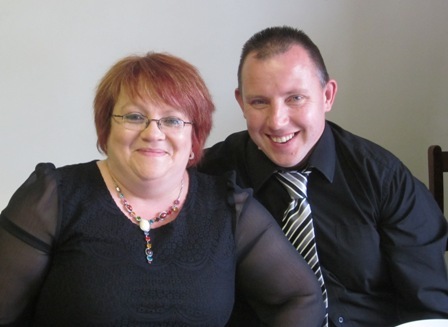 After the Ordination Mass the guests were entertained to dinner in the Aghabrack Community Centre. You can be assured that no one got up from the table hungry. Our thanks to all who did so much to give those who had travelled, from far and near, such a wonderful welcome (not to speak about the great meal!). Among those who enjoyed the festivities were members of the Friends of Africa (FOA) including Ciaran McShane, Barry Duffin and Fr John Denvir SMA (yes, that is his name – and he can sign too!) and Fr Kevin Mulhern SMA. After the meal we had the opportunity to watch different scenes from Fr Kevin’s life. Some brought laughter, others perhaps a tear, especially at pictures of those no longer with us. But no doubt they were looking down on us from their place of rest. Among the musicians who gathered to entertain us was Mr Joe Ward from Plumbridge who, at 91 years young, can still get a sweet tune out of a fiddle and a bodhrán. 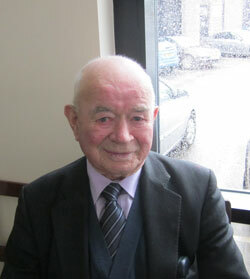 Many relatives and friends of Fr Kevin posed for photos.